I’m on the verge of spontaneous combustion right now. Why yes, I can predict and plan my own spontaneity. That’s one of the perks of being a sanguine Leo/Virgo cusp monster. Of course there are other perks, such as eyes in the back of my head (fine, they’re cross-eyed) and ninja-like shredding paper skills, but we don’t need to go into that right now. We have beer to put in pizza dough. !!! After I ‘grammed this pizza I even got a tweet from a reader who told me bevcookspizza.com was available and that maybe I should think about it. Has it really come to this? I hope so. Okay, the crust. The crust the crust the crust. I’m not kidding you, BEST crust I think I’ve ever experienced. Don’t let this confuse you with my favorite METHOD of cooking pizza dough, which was the skillet pizza method, hoooolmg. But this crust? Frickin’ craziness. Two reasons; you don’t have to knead it, there’s beer in it, and it bakes on a light coat of oil so it gets super crispy on the bottom. (three, whatever) I almost said “crisptastic” but I refrained because I like human friends. And as if the crust wasn’t enough to do me in, I topped the whole dern thing with a BLT. Should we take a moment of silence? 13 buckets of sweet cherry tomatoes, about 82,745 slices of thick center-cut bacon, some good store-bought or restaurant creamy Caesar dressing with a heavy hand of crushed red pepper in it, mozzarella cheese for days, and an f 150 truck bed of freshly torn romaine. I don’t even understand it myself. This pizza looks way bigger than what it really was. I didn’t event attempt to eat the whole thing at onc! – okay I’m totally lying. It was enormous and I joyfully ate every last particle. Your weekend basically depends on this. 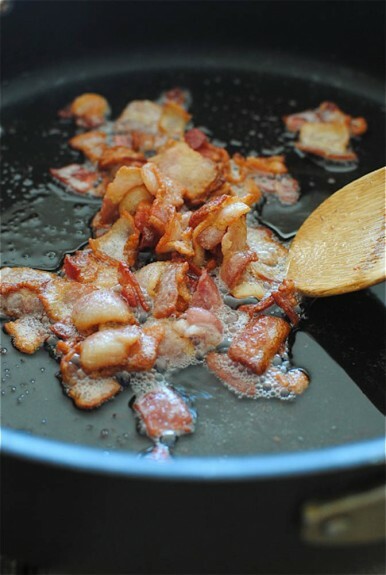 Cut the bacon into small chunks and cook in a large skillet until right under crispy, about 7 minutes? You’ll know it. Remove bacon and drain on a few paper towels. Alright, now take the dough and divide it in half with a pastry cutter. You can leave it as one big pizza as you want! 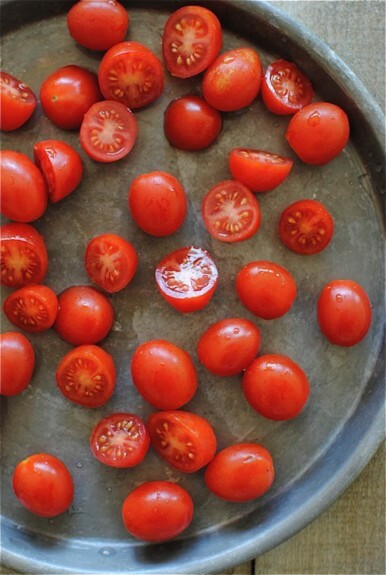 Grab a couple of baking sheets (or one huge one) and drizzle a Tbs. or two of olive oil all over it. Place the dough on the pan and tug and pull and spread and push and tug until it’s a nice looking rustic pizza thang. Spread the spicy caesar dressing over the dough, followed by a couple handfuls of shredded mozzarella, the tomatoes and bacon, and more cheese. Oh man. Slide it (them, it, whatever you choose to do) into the oven for abouuuuuut 18 minutes. Rick’s recipe called for 25 minutes, but mine cooked much quicker. Start checking at the 15-minute mark. The dough will seriously sizzle a little since it’s on olive oil. Unbelievable. Top with fresh romaine, slice and get all up in that. Personally, I can NEVEr get sick of pizza so keep them coming! Ha! 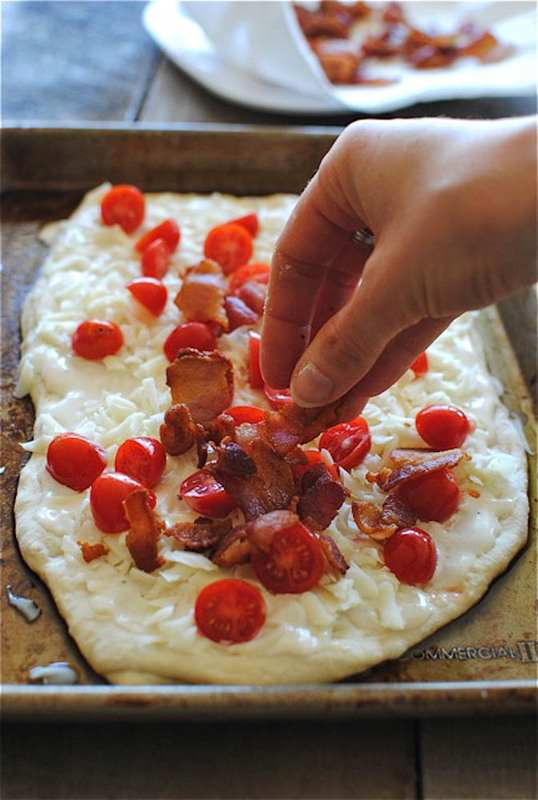 A BLT pizza is genius, I think i need to make this tonight! Pizza night is now officially ON. And Bacon is front & center. Yum! I love blts so this is right up my alley!! 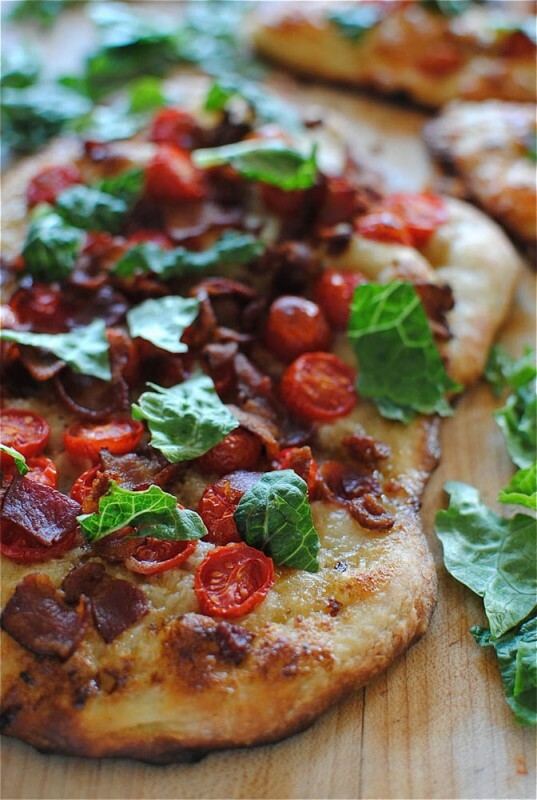 I am in favor of BLT anything and I'm going to love it even more when it's on pizza. 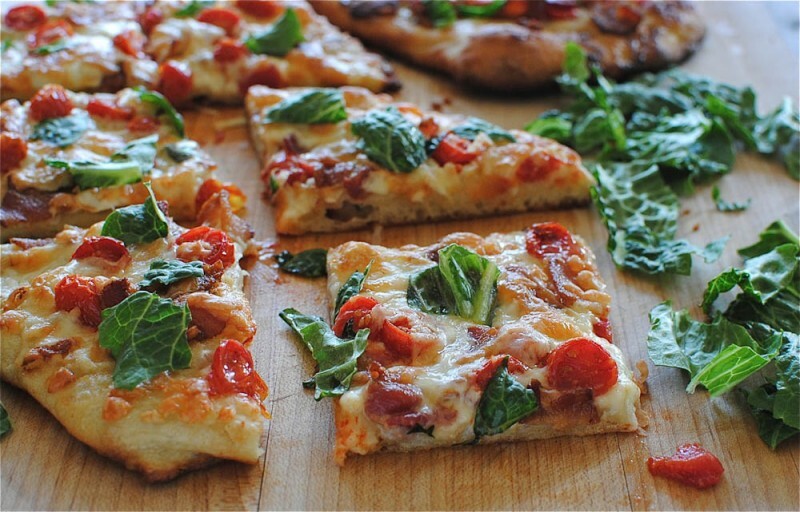 Love the idea of BLT pizza. I don't have lettuce, but I bet this would be great with fresh basil! BLT anything gets my attention. The Caesar, crispy bacon ....it's almost too much for me to handle. Almost. I love when you post pizza recipes! I love pizza so much! I need to make it more frequently. thanks for the recipe! YUM! That is the best BLT pizza I've ever seen! FEED ME!!!!!!!!!!! GIVE ME ALL OF THIS RIGHT NOW. I love this idea! And coincidentally, I have tomatoes I didn't know what to do with! If someone does not bring me this pizza immediately, I'm going to scream. Sorry, did you say that's there's beer in this dough...AND I don't have to knead it? Yeah, I'm sold. I saw this on Pinterest this morning and almost died! Now we have an excuse for another pizza night at our house!!! yes! Goodness gracious, I just drooled on my keyboard. BLT pizza is happening this weekend. This pizza is the definition of Friday happiness. Oh my gooodddddd, you kill me. 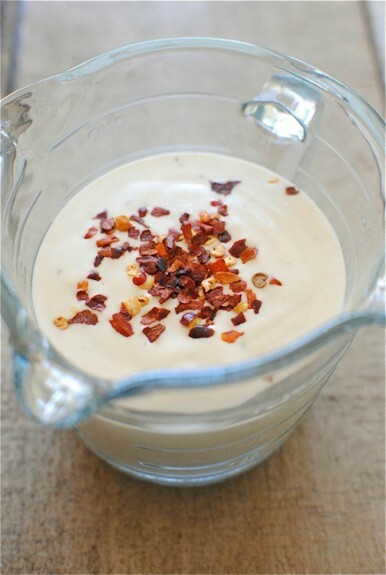 I literally want to proclaim my love for you every single time you post a recipe, except that's creepy, so I don't. OOOhhhh EEMMMMM GEEEEEE. Making this for dinner. beer steamed clams on the side!! I totally laughed out loud while reading this. You're hilarious. And I drooled too. Am considering making that crust TONIGHT. Not sure if I have 13 buckets of tomatoes on hand to do toppings though! I love that you have people checking domain names for you...hilarious! And this pizza is happening this weekend. Everything is better with bacon and homemade pizza is the best. Yummy! Nothing says "home" more than homemade pizza...and beer...and bacon.... Oh geez. I'm afraid I've been hanging around my husband a little to much! haha! I don't even eat the B in BLT and I love this pizza Bev! Sooo pretty! I'm totally down with bevcookspizza.com!! 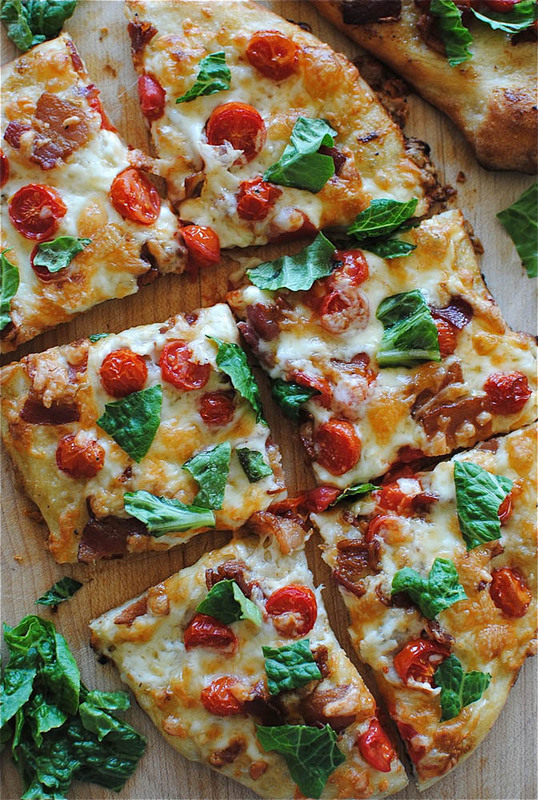 yes yes yes I love blts and would loooove to try this pizza! I have been backpacking around Asia for the last 6 months and am seriously missing some quality BLTs in my life!!! Wish I could have this right NOW! YUM! Wow, that is a divine looking pizza! I agree with Rosie up there this looks divine. Have you ever had Mellow Mushroom Pizza? There blt pizza is the best! This looks like a winner too! This is what dreams are made of. Want. Oh man, if you started a pizza website, the world would be a better place! This looks amazeballs! I'm sorry it's taken me a few days to get over here. Hot damn this looks amazing. We do a clam and bacon pizza (recipe on the blog) when we're on the Cape... but I have a feeling once I show my husband's family this one, my recipe will be replaced. Oh well. I made this on Saturday! I only deviated from the recipe by making an avocado ranch (plus the red pepper flakes, to make it spicier) for the sauce, since avocado compliments BLT so well. Ohmygosh, best pizza EVER. It's so good. I was concerned about the dough but it turned out perfectly. Thanks for the best pizza recipe EVER. Oh I'm so glad you loved it! Were you afraid the dough was going to burn on the bottom? Because I was, and I'd check it like every 25 seconds. But it turned out just fine. Yay, thank you for letting me know! Hi, Pauline! Did you put the dough on a light coat of oil on a baking sheet? That will help "fry" and brown up the dough on the bottom! Also, bake the pizza in the middle rack. That helps too. Something about science or something. I hope this helps! I could probably eat both of these. Right. Now. This looks delicious! Okay the truth is I will probably replace the ham with bacon but just because I really don't like bacon at all. For the rest: I will do exactly as you said. Thanks! You are funny. I enjoy you! 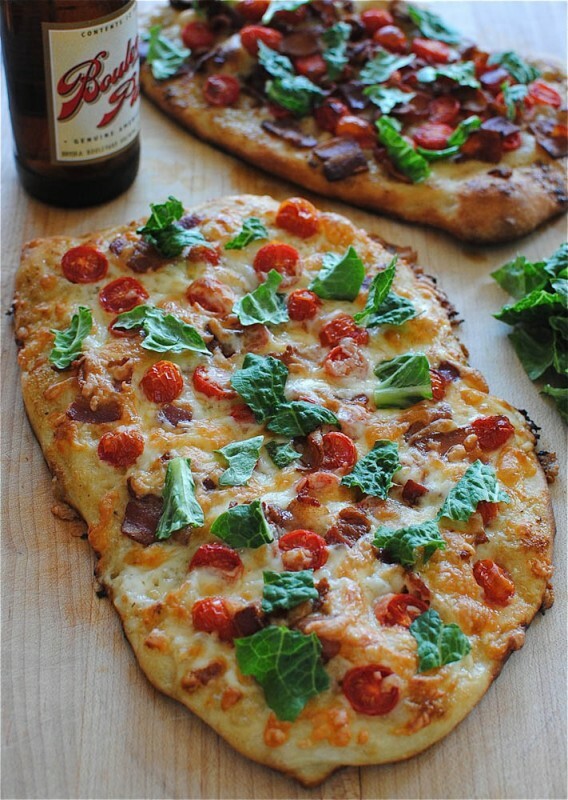 BLT Pizza looks delicious! and when we eat then i confrm it taste. Thanks! SO fantastic!! My husband and i loved everything about this and will absolutely make it again. I was afraid the olive oil + high heat would set off my smoke detector (does that happen to anyone but me? no? okay), but it totally didn't! Making this for dinner for me tonight. I have been on a really big pizza kick lately and can't wait to try this version! Wow! I made this two weeks ago to rave reviews, then again today. This time made with 3/4 of the flour whole wheat. It turned out great this way too. Definitely better with the white flour (had an almost sourdough-like quality), but still very good as whole wheat. When I made it with the white flour it sat for 2 days after mixing before I made the pizza, so maybe I'll try the whole wheat again but with more time to ferment (this time it was 24 hours). Thanks for sharing the recipe! Hello, i believe that i noticed you visited my website thus i came to go back the desire?.I'm trying to in finding issues to improve my site!I assume its adequate to use a few of your ideas! !